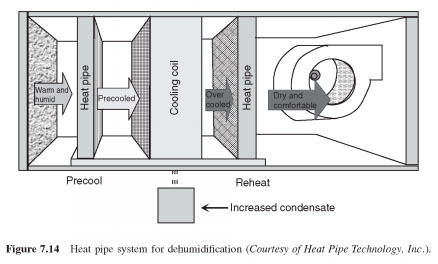 The principle of operation of heat pipes to dehumidify the air in the air conditioning system is quite simple. Heat pipe performs heat transfer between the warm return air from the room for the cold fresh air from the air conditioning coil. Operation of heat pipes can be described as having two sections: precool and heat (Fig. 7.14). The first section is the incoming air stream. When warm air passes over the heat pipes, refrigerant evaporates carrying heat of the second section of the heat pipe, placed downstream. Because some of the heat has been removed from the air to the meeting, the evaporator, the incoming flow is called precool the heat pipe. Air passing through the evaporator reduced to a lower temperature, resulting in greater removal of condensate. "Overcooled" the air is heated to a comfortable temperature on the length of the heat pipe section, using the heat transferred from the precool the heat pipe. This entire process precool and heat is carried out without additional energy use. The result is a system of air-conditioning, with removal of 50-100% more water than conventional systems. Advantages such as high efficiency, low air resistance, reasonable cost and the lack of cross-contamination, heat pipes offer the ideal solution for humidity associated with the interior air quality problems. With the correct application of heat pipes can be very economical to reduce initial and operational expenses. Even in the case of upgrading existing systems with custom built-to-fit heat pipes, savings in avoiding heat can pay for the heat pipe installation for several years. From the mechanical integrity and maintenance of view of heat pipes, with no moving parts, is expected to outlast the other components of ventilation and air-conditioning. As with any coil, periodic cleaning should keep heat pipes running at peak efficiency. Aggressive environments, can be processed coating of heat pipes with corrosion-prevention of plastic coatings Dinh, 1996).